I know for many here in Maine it doesn't feel much like spring. We've all waited patiently - the holidays came and went, then Valentine's Day, St. Patrick's Day, and now it's almost Easter. Still cold weather and even snow earlier this week. 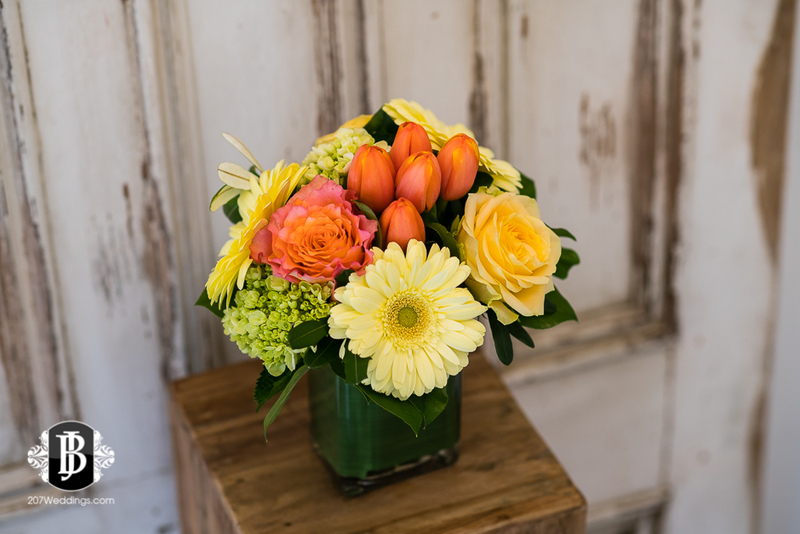 Which is why I was SO glad to come in to shoot Harmon's Floral Company's spring arrangements line. It was just the mid wintry-spring pick me up that I needed to combat the chilly blues! This was such a fun shoot, not only because the arrangements made the entire studio smell AMAZING, but there was also some behind the scenes silliness at hand. To mix things up, we browsed through storage and dragged out an ENORMOUS, old, weathered door that used to hang somewhere in the old building and used it as a backdrop. That's the thing with old Portland buildings - there is no lack of anything of vintage character. SO awesome. After some dusting and a good workout for two people, we got her set up and ready to go. Then we decided to get some different angles for the shoot, and in came the step ladder. I SO wish I was taller sometimes for moments like these, but as a vertically challenged person, you learn to make due and think on your feet. It ended up all working out fabulously, and we got some really great images for this shoot. And I am SO glad we were able to use that door!